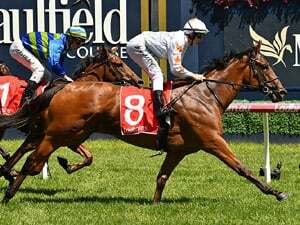 Trainer Mark Walker seems to have unearthed a promising two-year-old in Admiral Winston going with the impressive manner in which he powered home at his debut in the $75,000 Restricted Maiden race over 1000m on Sunday. The son of Declaration Of War has been showing good form on the training tracks and in his barrier trials, winning one and running on for second at the other, but there was still a question mark how an unraced juvenile would handle the pressure of a first race, especially against older rivals. After breaking from the second-worst alley (11), Admiral Winston ($31) settled at the rear three wide spotting leader Qiji Commander (Ben Thompson) around five lengths. The pace was genuine without breaking any land speed records. 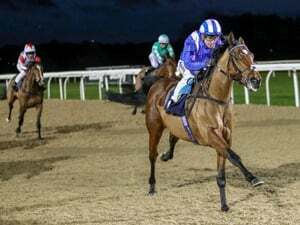 When Mr Alfonso (Juan Paul van der Merwe) pounced on the fading Qiji Commander, it looked like the James Peters-Oscar Racing Stable team would recombine for another weekend win after Mr Hooper on Friday night. But they had not reckoned with Admiral Winston who stormed home on the outside to finish over the top of all his rivals in one fell swoop. Mr Alfonso did well to hold on for second place a length away with Yulong Express (Syahir Abdul) third another half-length away. The winning time was 59.14 seconds for the 1000m speed dash. 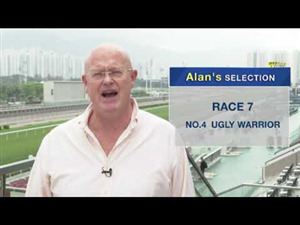 Walker, who has stretched his lead on the trainer’s premiership to six winners (23 against Michael Clements’ 17), had always held the new Te Akau Racing Stable-owned galloper in high regard, and was clearly not let down. “He’s a really nice horse. He wasn’t expensive; David Ellis (Te Akau principal) paid only A$30,000 for him at the Magic Millions,” said the Kiwi handler. “There is a lot of upside to this horse. I’m very pleased for Te Akau as this horse has a big future here. “I think he’s more of a three-year-old, but he will still go for the Aushorse races (two-year-old series). “I was only concerned about the barrier today as he’s only a two-year-old and was at his first prep, but he did a very good job. 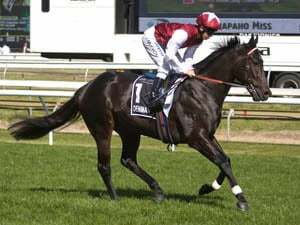 Interestingly, A’Isisuhairi might have honed his craft as an apprentice jockey in New Zealand in the early 2010s, but he seldom teams up with the five-time New Zealand champion trainer and two-time Singapore champion trainer. 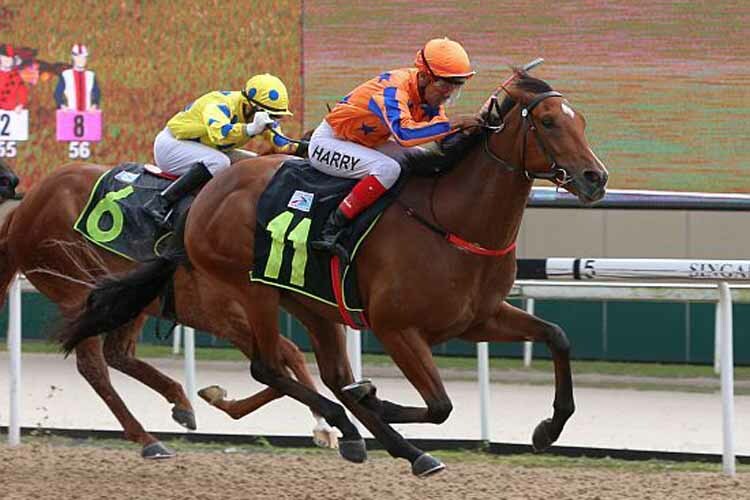 All-up from his total haul of 196 winners since he returned to Kranji in 2012, A’Isisuhairi has now ridden only three winners for Walker, the previous two being Lord Roberto on March 29, 2013 and Zac Star Destroyer on March 14, 2014. All that may change after his flawless handling of Admiral Winston on Sunday, which would be a shot in the arm for him given the fewer opportunities compared to his heyday when he was crowned Singapore champion apprentice jockey twice (2013 and 2014). “He’s a very promising young horse with a bright future ahead,” said A’Isisuhairi who was at only his fourth winner for the year. “I’ve jumped a few times on him, and I could tell he had an engine, but he does run off and is a bit shy, which is what he showed me in his trial (April 2). “Like I said, he’s a bit timid, but behind the gates today, I can tell you he was ready to run. Once he found his balance in the straight, he let down very well, he will keep improving. “Things are also going better for me these days. Mark Walker has been giving me some support lately. With his yard currently firing on all cylinders, Walker later went on to saddle a double with $39 shot Ka Chance (Riduan Abu Bakar) in the $20,000 Maiden race over 1100m.